The news is not all bad for Google, though; just this morning, iSuppli released new Android sales stats, and the numbers look pretty good. In fact, they look great. iSuppli's researchers say that Android's market share will surpass that of Apple's iOS by 2012, at which point Google's mobile OS will be used in 75 million smartphones. Google is known for its ambitious experiments. While some are notable successes -- in addition to Android, there's Gmail, Google Docs, Google Voice, and more -- others are less so. Here are four Google services, both rumored and real, that I think will soon go the way of Google Wave. Picking on Google Buzz is almost too easy; this Twitter-wannabe has been plagued with problems since its launch earlier this year. First, Google Buzz was criticized for disclosing your Gmail contacts to other Buzz users. Then, it was criticized for automatically linking to other activities in Google services -- like Reader and Picasa -- also used by Buzz users. Google was even hit with a lawsuit over Buzz. But you know what's worse than all of that? The fact that no one seems to care. No one is buzzing over Buzz these days. I took a peek at my Buzz account this morning, and the most recent post I see is from May...and that post is one that asks if anyone is still using Buzz. I guess we know the answer. Google News is one of the handiest services to come from Google. It aggregates a ton of news content, giving you access to a virtual newsstand right on your computer. I can't, however, say the same about Google Fast Flip. This service, now just about a year old, was designed to speed up the process of browsing through news stories online. Fast Flip presents you with an online news story laid out in such a way that it's supposed to look more like the content does on its originating site. Fast Flip ranks fairly high on cool factor; it's neat to look at and flipping through pages using the provided arrows looks pretty slick. But Fast Flip doesn't really accomplish its initial goal: making news browsing faster. Flipping through a stack of pages may look cool, but it actually takes more time than scanning a list of headlines. Google TV is the search giant's ambitious plan to bring its Android platform to TVs and set-top boxes as soon as this fall. In partnership with Intel and Sony, Google will deliver Android software that allows you to search for and view Web-based content from your TV. You'll also be able to control the system with your Android-based phone, play with Android apps (like Pandora) on a big screen, and access content stored on a DVR. But to do so, you'll have to buy a new TV or set-top box -- and no one knows how much that will cost. You'll also need to have that TV set up in range of a very strong Wi-Fi connection or near an Ethernet connection, otherwise all that Internet content will be inaccessible. No one knows how much a Google TV-enabled set or set-top box will cost, but I can tell you this: it won't be cheap enough to sway me. I've tested devices that let me access Internet content on my TV, and you know what I've found? Crappy YouTube videos look even worse on a big screen. We don't know for sure that there is a project called "Google Me." And we don't know for sure that Google is working on a social networking site designed to compete with (or perhaps kill) Facebook. But if Google is working on such a project, I think it's destined to fail. Here's why. If the purpose of a social network is to connect with other people, you need a social network that has plenty of members. And Facebook definitely has plenty of members, despite all the negative publicity it has received lately about its privacy problems. Will all 500 million Facebook users migrate to Google Me? I doubt it -- and those 500 million members are what makes Facebook so attractive. You may argue that those people who abandoned Facebook because of its privacy problems might make the move to Google Me, but unless they're bringing millions of their closest friends along with them, they're not going to do much good. And Google doesn't exactly have a stellar reputation when it comes to social networks and privacy (see the aforementioned section on Google Buzz), so it may have trouble winning people over there. What do you think? 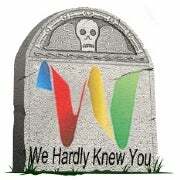 Which Google services will survive, and which ones will go the way of Google Wave? Sound off in the comments.